This was a collaboration piece that took place with the help of a week's worth of work put in by students at South Dakota State University in October, 2013. 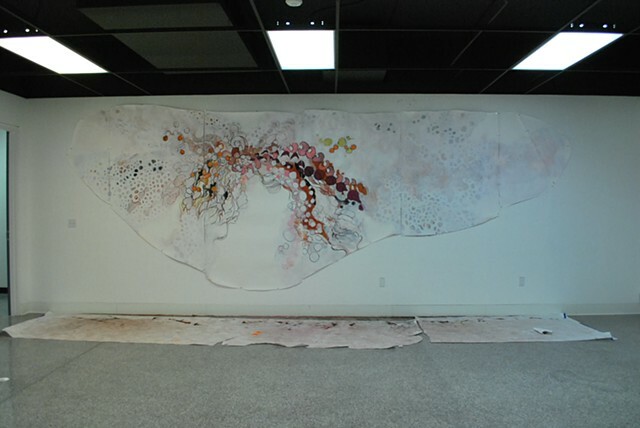 We made a large, irregularly-shaped, life-size drawing that was created over the seven days by myself and others. Additionally, we took photographic stills of us making the piece and turned it into a short animation, one where you could see us all working on it, and another of the image "moving" as it was built. This image is the last in the series of many images and shows how the work was displayed in the space along with the video.